First, packages are only updated monthly, so the wait for patches is slow. Additionally so far the QA process for the various distributions is a little spotty, so the if a package is broken when the update occurs is may be a month until the problem is fixed. Secondly applying a much needed patch from source may break a package installation or have the patch overwritten when a package update occurs. For those testing or developing OpenStack, using a package based install would be impossible, since the packagers place files in difference locations and make it impossible to push source files to the OpenStack github based repos. For this most developer use devstack as their install vehicle. Devstack is a great tool to get a simple OpenStack environment running but It can be cranky and difficult to get multi-machine OpenStack environments running. The choice is to install OpenStack from source. For most folks, source installs are undesirable and messy, but since OpenStack is completely written in python, source installs eliminate the temperamental and slow compilation step. Additionally since each service also has its own python requirements file, the python installer uses pip to install any python dependencies. This greatly simplifies the installation process and results in an install that can be used for either development or production. It is worth noting that some newer OpenStack installer projects such as stackforge's os-ansible-deployment have moved to source installs. Currently it is located at this stackforge GitHub repository. The ansible installer is now part of the OpenStack big tent efforts and shortly will be located at a repository within the openstack organization. This discussion demonstrates how to install OpenStack from source onto three machines using Ubuntu 14.04 LTS as the base OS. 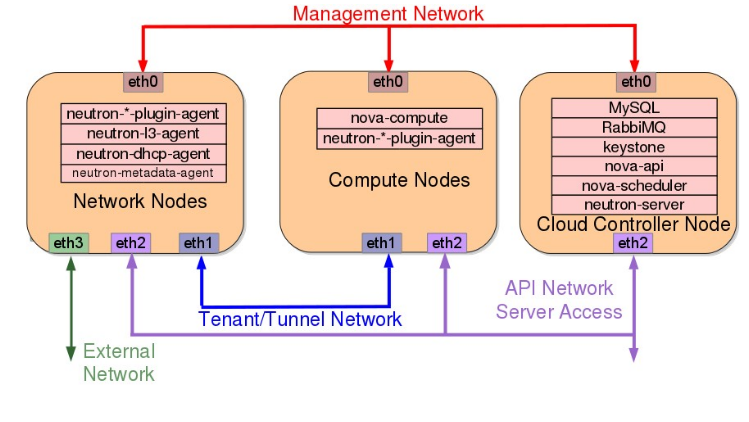 The three nodes consist of compute, network and controller nodes, using separate control and data planes, an access/API network and one external network connection. Each node needs at least 3 NIC cards (the network node needs 4). Users are able to create simple legacy routers and an external provider router. The following diagram gives a physical representation of the final OpenStack system. The output should be 1 or higher to be able to use KVM for virtualization. An output of 0 means you have to use QEMU for virtualization. create home directories for the service and other needed directories, i.e. log, lib, and etc. Let's get started installing keystone on the controller node. Set some initial shell variables which are used in the installation to simplify the install process. MY_IP and MY_PRIVATE_IP should be the IP for the NIC card on the controller to which the the management plane is assigned. Again perform this on all three nodes. mysql  -u root -pmysql -e "create database keystone;"
mysql  -u root -pmysql -e "GRANT ALL PRIVILEGES ON keystone. * TO 'keystone'@'localhost' IDENTIFIED BY 'keystone';"
mysql  -u root -pmysql -e "GRANT ALL PRIVILEGES ON keystone. * TO 'keystone'@'%' IDENTIFIED BY 'keystone';"
Copy the sample keystone conf file provided by the keystone project and set the database and token info within the file: Note: For a production system, set a more complex token than what is used in this example. Congratulations, keystone should now be installed and running. In the next article of this series, we will install glance and neutron on the controller node.